Sen. Bernie Sanders addresses the convention. 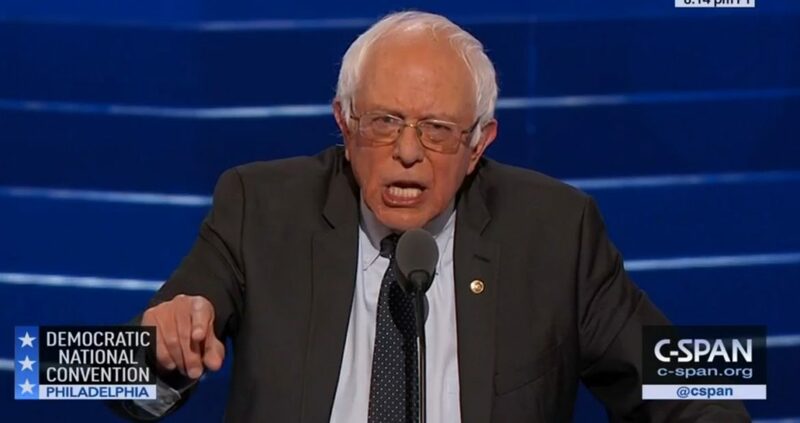 PHILADELPHIA — Bernie Sanders’ supporters in the Maryland delegation at the Democratic National Convention are following his lead in endorsing Hillary Clinton, even in the aftermath of leaked emails implicating high-level party officials in trying to influence the primary process in her favor. The Maryland delegate breakfast at the Inn at Penn on Monday kicked off the first convention day. Signs of disaffection among Sanders backers surfaced quickly. Volunteers from the Sanders campaign collected signatures of delegates pledging support for the Vermont senator at the breakfast. One of the volunteers estimated they had roughly 35 signatures. Sandra Falwell, 67, a Clinton delegate, said she supports Sanders for many reasons, but said, “I’m taking Bernie’s lead,” when it comes to whether she will vote for the former secretary of state. Kendra Ziegler, 32, a delegate from Silver Spring, was a “Bernie or bust” voter for a brief period of time, but said she will follow Sanders’ lead. “I trust that he will do a fantastic job leading me as a delegate,” she said. “I just feel validated,” by the email leak, Ziegler said, explaining she always felt the party was working against her candidate. But the resignation of Democratic National Committee Chairman Debbie Wasserman Schultz was not much punishment because “she’s getting the job she’s already had for a year and a half,” as an honorary Clinton campaign adviser, Ziegler said. Falwell said the “total conspiracy to keep a candidate down” is criminal, and Wasserman Schultz was the scapegoat the party needed. “It had to be her,” she said. Some of the delegates see this year’s contest as more than an election. Sanders faced some challenges presenting the most progressive platform for a Democratic candidate, she said. Sanders “presents the best and brightest of what we can be,” Carrington said.